Mint condition Yamaha P-45 keyboard. This is the perfect keyboard for at home or taking to gigs/ easy to travel with, as it is very lightweight and compact. 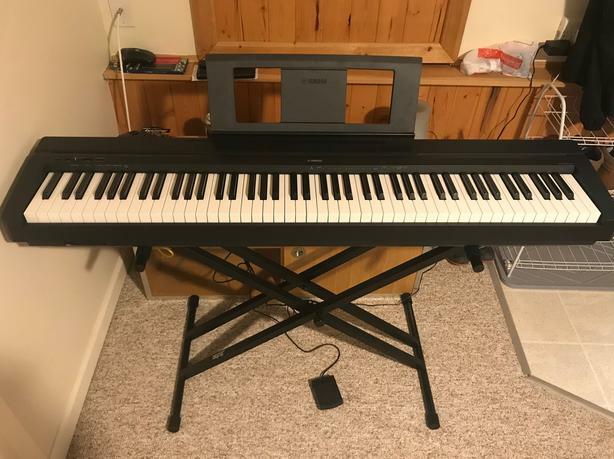 It comes with a music stand that attaches into the back of the keyboard, a sustain pedal, and sturdy, fold-up metal stand which has adjustable heights. This is a perfect piano for all levels of musicians. The 88 weighted keys and many sound settings allow for a smooth, professional playing experience. There is also a headphone jack port on the back for quiet playing. Please email me if you are interested. Pick-up required. (I live in the Gordon Head area of Saanich.) I would be happy to answer any questions you might have and to arrange a time for pick-up.